This book brings together key essays from the career of social theorist John O’Neill, including his uncollected later writings, focusing on embodiment to explore the different ways in which the body trope informs visions of familial, economic, personal, and communal life. Beginning with an exploration of O’Neill’s work on the construction of the biobody and the ways in which corporeality is sutured into social systems through regimes of power and familial socialisation, the book then moves to concentrate on O’Neill’s career-long studies of the productive body and the ways in which the working body is caught in and resists disciplinary systems that seek to rationalise natural functions and control social relations. The third section considers O’Neill’s concern with the ancient, early modern, and psychoanalytic sources of the post-modern libidinal body, and a final section on the civic body focuses specifically on the ways in which principles of reciprocity and generosity exceed the capitalist, individualist body of (neo)liberal political theory. The volume also includes an interview with O’Neill addressing many of the key themes of his work, a biographical note with an autobiographical postscript, a select bibliography of O’Neill’s many publications, and an extensive introduction by the editors. 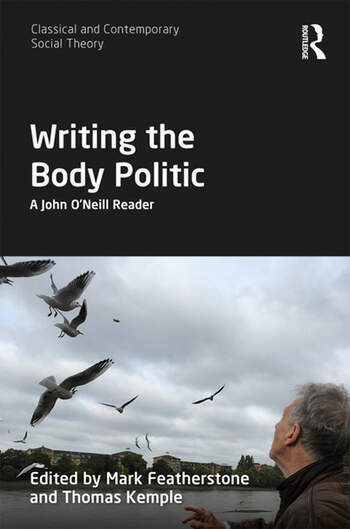 A challenging and innovative collection, Writing the Body Politic: A John O’Neill Reader, will appeal to critical social theorists and sociologists with interests in the work of one of sociology’s great critical readers of classical and contemporary texts. Mark Featherstone is Senior Lecturer at Keele University, UK and author of Tocqueville’s Virus: Utopia and Dystopia in Western Social and Political Thought (2006), and Planet Utopia: Utopia, Dystopia, Globalisation (2017). Thomas Kemple is Professor of Sociology at the University of British Columbia, Canada, and author of Reading Marx Writing: Marx, Melodrama, and the ‘Grundrisse’ (1995), Intellectual Work and the Spirit of Capitalism: Weber’s Calling (2014), and Simmel (2018).